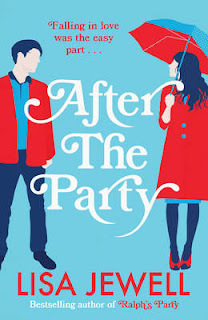 Wicked Wonderful Words: Review: "After The Party"
Anyway since then I have read "Ralph's Party" several times, it is one of those comfy books that always make me smile, especially the eating-raw-chilli-competition. Then a few weeks ago I was on a London tube station and I spotted a large poster for a books called "After the Party" by Lisa Jewell. Turns out now there is a sequel to the wonderful "Ralph's Party" and of course I had to get it. It has been eleven years since Jem and Ralph went home from Ralph's party together. Back then they were sharing a flat with Jem's devious, deceiving boyfriend Smith who was using Jem to make Cheri jealous and now they have a house in South London as well as two kids and lots of issues. Ralph is feeling detached from his small family and Jem is entirely consumed by her wonderful kids, the bright Scarlett with the fierce personality and the little baby Blake who is growing every day. Ralph is struggling to find his painter mojo and though he is making a living as a painter, a good living, he feels that he has lost the love for his art. So in a desperate attempt to find his passion for art, for Jem, for the family, he goes to visit Smith in Los Angeles leaving Jem alone in grey, rainy London with two screaming kids... Alone to go to the playground and meet a nice dad whose daughter is the same age as Scarlett. So while Ralph goes to a Christian concert with the gorgeous Rosey, Jem goes to have tea with soft single dad Joel. And from there it all goes wrong, more than wrong. I liked it. Not as much as I like "Ralph's Party" but it was a decent sequel. Great to catch up with Jem and Ralph again and to reminisce about that chilli fight. Also I found the discussions about spirituality and Christianity very interesting. Religion is a topic that is rarely dealt with in chick lit but I think that Lisa Jewell did a really good job of showing how Christianity can make a difference in the rushed, modern lives we life. Read it if: You've read "Ralph's Party" and wondered what happened next or if you want to read a strong chick lit novel about the difficulty of being a modern family striving to have it all and lead the perfect life. I read Ralph's Party right when it came out and also when I was going through a bit chick lit phase. It was probably one of the first books I read in the genre (one of the better ones too) and what got me hooked. I don't read chick lit much at all now but I'd be curious to read this one. Glad you thought it was a good read.